Boston Loves Paris: Bonne annee! It is the second day of 2008 already, and it's still cold here in Boston. Cold enough to support the ice sculptures on "First Night." 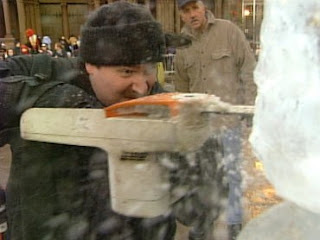 Guillaume and Angela walked from their apartment down to Copley Square to see the crowds of people and the huge ice sculptures that artists create with very dangerous chain saws! 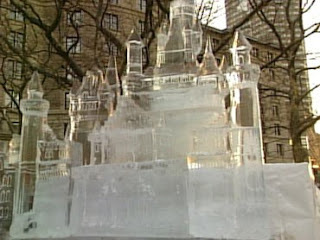 This is one of the finished sculptures - it might be a Disney castle. Angela and Guillaume couldn't get very close to the sculptures to take pictures, but they were very very pretty. There were so many people looking at the ice, and no one was moving out of their way. Guillaume finally lifted Angela up in the air so she could see them, and they were pretty! They realized that it was far too cold, and far too crowded, and they wanted to be home and warm. So they stopped for some bread at Cafe Vanille on Charles Street, and went home and had some champagne! Later on New Year's Eve, Guillaume cooked his special filet mignon, and they drank champagne and wine and watched a movie. Guillaume was going to go to his work for a party at 1:00 a.m., but his colleague called him just after midnight and told him he wasn't going, so Guillaume stayed home instead! On New Year's Day, Angela and Guillaume decided to go to Vas & Sal's house. But first, Guillaume wanted to take down the Christmas tree. It didn't take too long at all. The apartment looks a little empty without the tree. At around 12:30, they set out on the road to go to Vas & Sal's house. Of course Guillaume drove. It was his first driving experience in a snowstorm! He is wearing his cool new hat, too. This is the driving conditions on the way to their house. Guillaume wasn't scared at all. They stopped for gas when they arrived in town. Angela's Christmas present to Guillaume is on the dashboard (it's a GPS system so he won't get lost in his new city). Guillaume is very happy that he's safe, and he only has 5 more minutes to drive in the snow. Guillaume is very happy that they arrived safely at their destination! This is Vas & Sal's snowy driveway. They are safe and warm at Vas & Sal's (and hungry for some food, too). They had not seen Vas & Sal for a long time, and were very happy to see them. Angela just finished telling a very long story about the Opera House in Boston. She thought it was funny. Guillaume looks like he has something stuck in his teeth. Angela is sure he was interested in her story, though. There was a lot of food and wine, and of course lots of good conversation. Angela was sorry to have to pull Guillaume away, but 6:00 a.m. comes very early! They are very excited about their upcoming trip to New York. They are taking the train on Friday morning, and will see Vincent & Martine on Friday afternoon! A little Paris in America, mais oui! And we LOVED the pictures from New Year's Eve in Paris! Click here http://the-histories.blogspot.com/ for a message from Andrew. I see you enjoyed Holidays as we do but now, we have to eat carrots and green beans..you see what I mean..Love.. Thank you so much for your best wishes !!!!!!! I was so so happy to receive my first card from you ! Unfortunatly, we are going to eat all the day long at a Guy's cousin. hi, how was NY?? Hope ya had a yummy sidewalk pretzel!!!! I see there is lots of eating going on in France too! Sunday I controlled my dietary intake by overcooking the falafel. Nothing new under the sky..bad weather, many work meeting..
quiotu wom rhouminet bral tikq formad in hostiose pertéro zimby.